Choosing the right mattress can be an intimidating task! With so many mattress companies online, today’s consumer has plenty of choices. 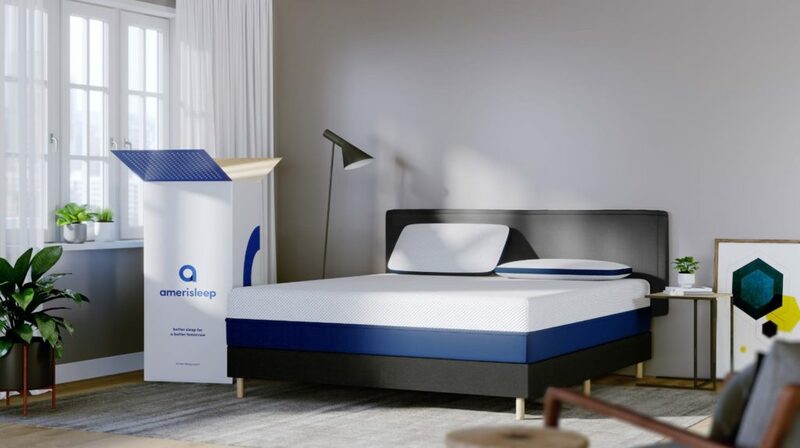 Two of the leading one mattress retailers are Helix and Amerisleep. To help figure out which one is right for you we have compared Helix mattress reviews and Amerisleep reviews. Reading the reviews on their site can be helpful, but don’t often tell the whole story. Based in New York, Helix Sleep is an American company. It has one showroom in Manhattan and does most of its business online. Adam Tishman, Kristian Von Rickenbach, and Jerry Lin founded Helix in 2015. The three bonded over the difficulties of buying a new mattress in a new, unfamiliar city. They created Helix Sleep in response. Founded in 2007 in Scottsdale, Arizona, Amerisleep came from a similar background. Amerisleep decided to make different mattresses (the AS1, AS2, AS3, AS4, and AS5) and to build those mattresses for specific types of sleepers. For example, the Amerisleep AS3 was listed by Allure as one of the best mattresses available online. This makes sense as the Amerisleep AS3 was designed to fit as many types of sleeping positions as possible (stomach, back, and side sleepers). While Amerisleep’s AS2 was included in our guide on finding the best mattress for lower back pain. It cut out the middleman so it could reduce the price and provide a top quality mattress to more consumers. Additionally, Amerisleep wanted to be eco-friendly. It designed its mattresses with plant-based materials, using less petroleum than its competitors. Plus, Amerisleep uses a one-of-a-kind manufacturing process which emits virtually zero emissions. Amerisleep is an online retailer that also has eight physical locations. Those stores are in Arizona, Colorado, and Texas. Amerisleep vs. Helix: What Are They Made Out of? Amerisleep’s plant-based Bio-Pur® memory foam has a unique open cell structure. This structure encourages air movement and keeps the sleeper cool. Compared to traditional memory foam, Amerisleep offers a much cooler experience. Amerisleep makes five mattresses: the AS1, AS2, AS3, AS4, and AS5. Every model, besides the AS1, which is Amerisleep’s firmest model, uses HIVE® technology. Like all layers of Amerisleep mattresses, the core layer is made with the unique VPF foam manufacturing process. This process allows Amerisleep to salvage more raw materials, create virtually zero emissions, and make an eco-friendly mattress that is still supportive. 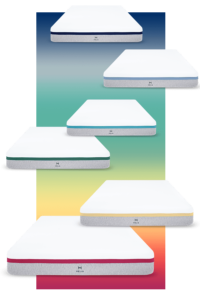 Depending on which Helix mattress you’re looking at, it’s either made of memory plus foam or a latex foam hybrid. Amerisleep offers a simple, streamlined process for choosing your best mattress. Amerisleep has five mattresses: the AS1 (firm), AS2 (medium firm), AS3 (medium), AS4 (medium soft), and AS5 (soft). The naming of each mattress makes it clear what type of mattress you’re getting with each model. On their site, it also indicates which mattress is best for what kind of sleeper (side, back, or stomach). With the Helix, there are more options. Helix offers nine different models, including Sunset, Moonlight, Dusk, Twilight, and Dawn. It also has three specialty mattresses: Nightfall, Duel Balanced, and Duel Extra. Some might appreciate the extra options available at Helix. Customers can even take a “sleep quiz.” The quiz helps identify which sort of mattress is best suited for them. Customers identify their sleep preferences. Do they want firm or soft? Which sleeping position do they prefer? They also provide their size and weight. Then, Helix recommends the ideal mattress for them. Buying a mattress online might seem like a risk. You’re buying something you may not have even touched, and you’re going to be spending a lot of time on it. Fortunately, both Amerisleep and Helix offer lengthy trial periods and warranties. However, though one outshines the other. Helix offers a 100-night trial (during which you can return the mattress free of charge). It also offers a 10-year warranty. You can return the mattress if something breaks during those 10 years. At Amerisleep, you also get a 100-night trial (and money back guarantee) and a 20-year warranty. The first 10 years of your warranty offer your full dollar value spent towards a new mattress if your current mattress is defective. The second 10 years offers you half your dollar value if your mattress is defective. According to their website, a Helix mattress arrives in a box roughly the “size of a bag of golf clubs” via UPS Ground. Shipping is free for US orders and $20 for Canadian orders (plus Customs Tax). It arrives within 3 to 7 business days. Amerisleep offers free shipping in the US. Your mattress ships between 3 to 5 days after your order via FedEx. It arrives within the following 1 to 5 business days. All Amerisleep packaging is environmentally responsible. According to the Helix site, there are 1,068 reviews with an average of 4.6 stars. Some reviews mention that they sleep hot at night. Others complain of the mattress being too stiff. Amerisleep reviews paint a fuller picture since there are 14 times as many reviews. Amerisleep has positive reviews, including over 14,000 verified reviews at a 4.7-star average. Additionally, 98% of Amerisleep customers would recommend it to a friend. Most Amerisleep customers (99%) give a rating of 3 or more stars. 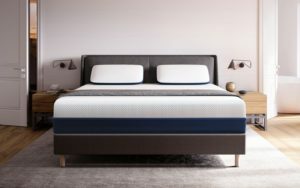 Amerisleep’s very high customer reviews is one of the reasons we also have it listed as the best mattress of 2019. Amerisleep is our recommendation between these two companies, and specifically the Amerisleep AS3. One of the best qualities of this mattress is it is a great fit for back, side, and stomach sleepers, and everyone in between. It uses a cover with a material FDA-determined to promote better sleep and a supportive and contouring plant-based foam. Enjoy this guide? Check out our guide on comparing Nectar Mattress and Amerisleep.